***UPDATE: The Kurt Kinetic Rock & Roll is now a SMART TRAINER and a SMART CONTROLLED TRAINER. What this means is that it comes with the Kinetic inRide as standard. 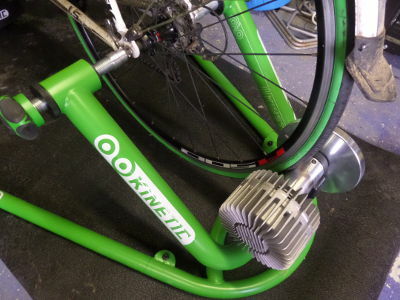 So the trainer and Kinetic inRide is exactly the same as discussed here, just you do not need to buy them separately as the Kinetic inRide comes already attached when you buy it. 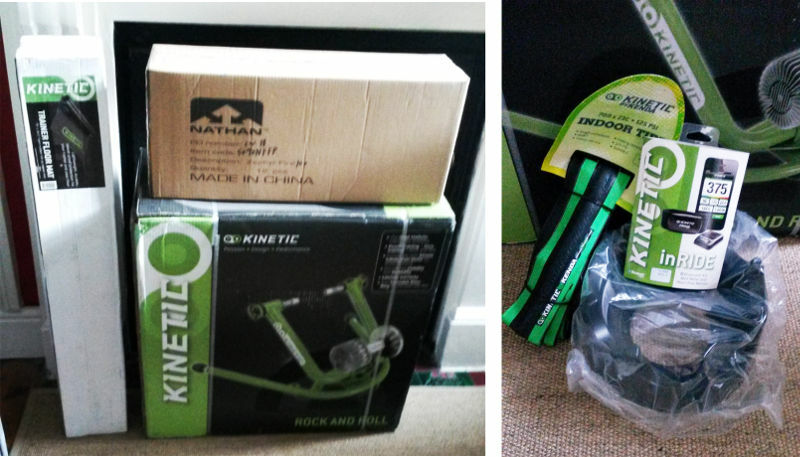 So, we’ve got our hands on the new Kinetic Rock & Roll turbo trainer along with a few of its accessories. We’ll not only be reviewing the indoor trainer itself but also the Kinetic inRide hardware (Bluetooth smart heart rate monitor & inRide Pod), & software (iOS inRide App), the Turntable Riser Rig, the Kinetic Trainer Matt, and the Kinetic Trainer Tyre. 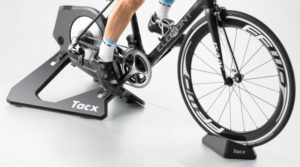 The main selling point or differentiator if you like of the Kinetic Rock and Roll trainer from the other trainers out there is the fact that (as it’s name suggests), it rocks and rolls as you ride. What this means is that the main resistance unit to which the back wheel of your bike is fixed moves. Watch the video below to see how much movement you get while during different riding styles. 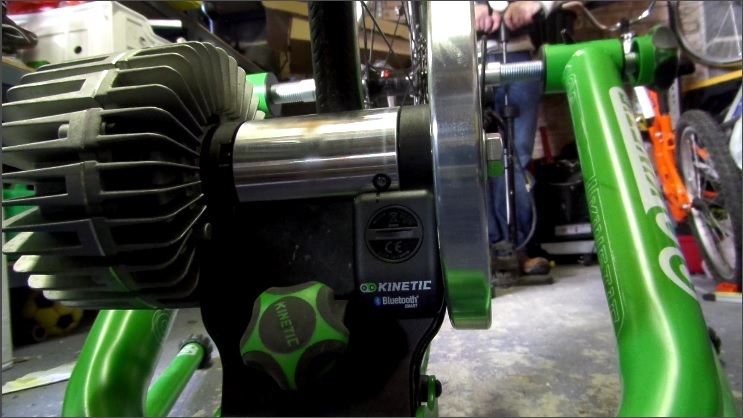 The video below (taken from Kurt Kinetics website) shows how to attach your bike to the turbo trainer. The trainer basically comes fully assembled, all you need to do if attach the support arms to the main trainer frame. All tools to do this are provided and it is simple to do. First impressions of this trainer are that it is a quality piece of kit made from solid materials. It looks and feels robust, as signified by the heavy duty support arms in the following image. Other trainers we have tested do not have this same build quality. However, it is worth mentioning now that this is not a cheap trainer (see best prices below). But for a higher price you not only get the quality build but you also get a ride that is specifically configured to be as road-realistic as possible. The Rock and Roll trainer uses Kinetics Fluid resistance unit, which means as you spin your back wheel on the resistance roller it in turn spins a blade within a fluid. The resistance is progressive, meaning the faster you spin the blade (i.e. the faster your back wheel spins) the higher the resistance gets. This is not a linear resistance curve but instead the resistance curve is, well, curved. The resistance increases at a steeper rate the faster you pedal (see image below). This is comparible to cycling outside, as you can see when the normal (outside) resistance curve is compared to that of the Rock and Roll trainer. Again, sometimes you get what you pay for, and this is the case with the Rock and Roll fluid trainer. The trainer is calibrated to ensure that each time you use it the ride is exactly the same, and to ensure this a thermodynamically neutral medical grade silicone fluid is used in the chamber that provides a consistent, repeatable workload that is not affected by temperature (fluids heat up when objects spin in them). 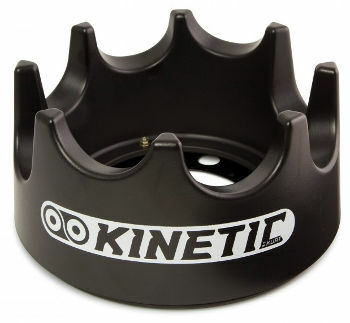 As mentioned by Kinetic themselves on their website, the Kinetic fluid trainers use a patented magnetic drive system for a lifetime of leak-proof performance. 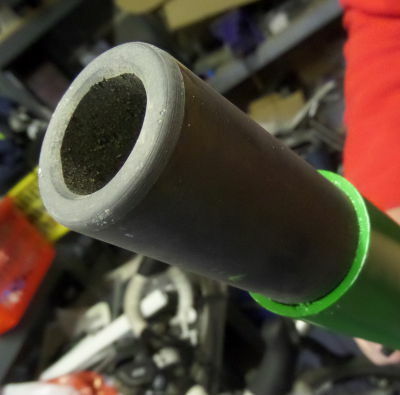 Other fluid trainers can have a drive shaft that enters the fluid chamber directly, potentially introducing a possibility of some leakage over time. This spinning drive shaft is the weak point of the unit, so that Kinetic magnetic drive system uses two sets of powerful magnets on either side of a separating wall, so there are no moving parts entering the fluid chamber (see diagram of the fluid resistance unit below). As mentioned at the start, the main design feature that sets this trainer apart from all others out there is the patented frame design. This frame aims to create the most realistic trainer feel because it allows the bike to move as it does on the road. Other trainers are static and fixed, meaning you can lean to the sides and nothing happens. However, with the Rock and Roll turbo trainer the frame does move so you need to use your core muscles to maintain a good riding position. By forcing the rider to maintain form on the bike, the Rock and Roll forces riders to stabilize themselves by using their core muscles. Also, when trainers do not more we recommend that you do not get out of the saddle while riding because it could add extra strain to your bike and/or trainer. There are no such concerns with the Kinetic Rock & Roll. The video below is the promotional video by Kurt Kinetic that shows of the rocking and rolling action of natural cycling and cycling on the indoor Rock & Roll trainer. The inRide lets you record power, cadence, and heart rate but it requires the additional inRide hardware. This includes a sensor pod (that also includes a rubber grommet and small magnet), and a Bluetooth heart rate monitor. Let’s be honest, the inRide is not cheap and the question is… Is it worth it (we give our thoughts in a minute)? The inRide sensor and heart rate monitor communicates with an inRide App (FREE), that is available for iOS devices. This is a bit of a downside for this software because not being available for Android devices alienates a large proportion the the world who may want to use this technology. In fact our review was delayed as we needed to get our hands on an iPad so we could use the inRide technology. Hopefully this is something Kurt Kinetic will address soon. How does the inRide technology work? The Kinetic inRide is kinetics next-generation power meter that uses Bluetooth Smart™ communication protocol, that is found in modern Apple devices (iPhone 4s, iPhone 5, iPhone 6 and the iPad 3, 4, and Mini, and the iPod Touch 5th generation). This is a wireless system and pairs the kinetic heart rate monitor and power sensor pod with the new Kinetic inRide (Apple) App. 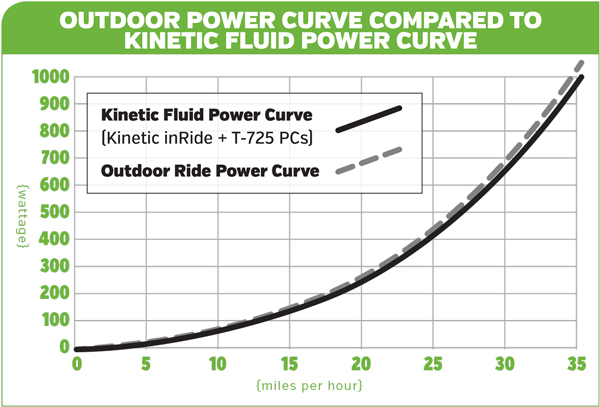 This measures power with any Kinetic fluid trainer. Firmware in the inRide Sensor Pod measures speed and cadence (via the spinning magnet that is attached to the trainer roller) and translates this into wattage (using some “simple” equation…). Power, cadence, and heart rate data is collected and displayed on your (Apple) device. Again, not being available on Android devices is something that needs to be addressed. Also, since Bluetooth technology is used those owning an ANT+ heart rate monitor or cadence sensor cannot use these with the inRide App. In short we liked it a lot, after we finally got an Apple device to use it with. The inRide App was smooth and worked very well. It is a polished App and the touch responsiveness was very good and the setup was straight forward. We didn’t go deep into the settings and did not customise displays and workouts, but while using the default programs we liked the way it worked. The displays were clear and the system of maintaining power levels during the workout programs was good. 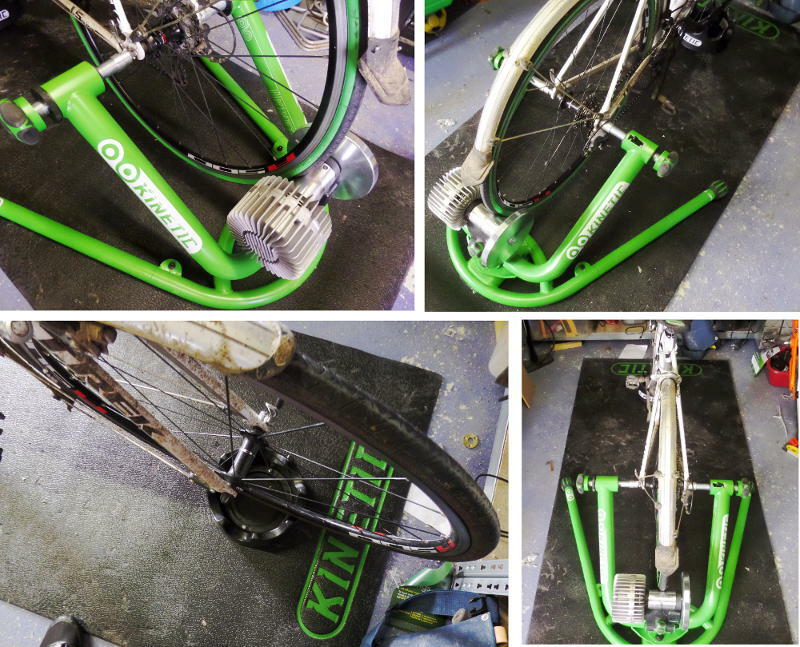 The inRide does add something positive to the indoor cycling experience, and although not cheap it is a good piece of kit that will help you get more out of your Kinetic turbo trainer. Below are two videos. The first shows fixing the inRide components to the trainer and the second shows us using the inRide App. A note on fixing the inRide components. It was not as easy as it looked on the official Kinetic instruction video that we showed above, but this was probably down to the extremely cold weather that we were doing this testing in. The rubber grommet was harder (stiffer) in this cold weather and this is was more difficult to push it into the hole in the trainer. However, with a little encouragement (via the flat end of a screwdriver) it went in. The magnet fitted easily into this grommet. Also, we found it a little tricker than the video showed to attach the sensor pod, mainly due to the tight space, but again this wasn’t a major issue and we got it on easily enough (see video above). The following video shows the inRide App in action. This camera was attached to the handlebars of the bike so things move around a bit, but you get the idea of how the software works and the kind of data that is available to you. The turntable riser rig has two functions. One is to raise your front wheel off the ground so that your bike is in a natural riding position, and the second is to allow your front wheel to move (rotate side-to-side). The first function is important because your back wheel is elevated on the resistance unit, but how necessary is the facility to rotate the front wheel? The aim here is to make things as natural as possible, and when you are cycling, particularly when you get out of the saddle and power up a hill or during a sprint, then you bike moves around a lot. This is true of the front wheel. The swiveling base of the turntable riser rig does allow this, but it was difficult for us to know how much this improved the riding experience. Although, as shown in the rocking and rolling video (see 1st video in this review), the front wheel does want to swivel so perhaps this is proof that allowing this movement is a good thing. The role of a trainer matt is to protect your floor because you sweat buckets on a turbo trainer and your potentially dirty bike coupled with high forces and movements can cause your floor to become dirty or potentially damaged. Also matts are designed to reduce vibrations so this can help make indoor training less noisy. We were testing the Rock & Roll trainer on a solid concrete floor so none of the above mentioned concerns really applied to us. This meant that training with or without a matt was pretty much identical, but if we were using the Kinetic Rock & Roll trainer indoors or on a surface that we didn’t want marked then we would definitely use the training matt. Saying this however, having the trainer on a matt did set out the trainer area nicely and made the environment feel that little more suitable for purpose, if that makes any sense? People state that if you are going to use an indoor cycle trainer for any significant period then a special trainer tyre is a must. We agree. Your bike tyre will wear so to avoid this you are advised to use a special trainer tyre. Of course you can use any trainer tyre and it is not necessary to use the Kinetic one with a Kinetic turbo trainer, and you can even just buy a cheap normal bike tyre and use this. One benefit of using a good quality trainer tyre like the Kinetic one is that it is very hard wearing and smooth. This means it will last for a long time and also it will reduce noise as you work out. Also you get optimal grip that means less chance of slippage between your tyre and the trainer, which improves preformance. We’ve said it before and we’ll say it again. Kinetic are creating high quality products that carry a representative price tag. We like it a lot. It’s not cheap but it is extremely well built and you notice this immediately when you take it out of the box. The ride is smooth and it feels good, and we did like the fact that the trainer moved. Whether this is a major factor for you is a personal choice, and essentially the Kinetic Road Machine is the exact same trainer without the Rocking & Rolling function and it costs about £100 less. The fact that the inRide was only for Apple products was something that annoyed us a bit, mainly because we have more accessible Android devices to hand. But if you have a compatible Apple device then the inRide is great. It’s not cheap but it functions well and it will definitely improve your indoor cycling experience. We’d definitely recommend this trainer if the price point is not something that would put you off. In total if you want the trainer and the inRide it will set you back £500 to £600. One positive is that this is a one off fee and there are no subscription charges that apply to the software of some other trainers.